As agile coaches, we are meeting with HR people more and more often. Whether at companies, or seeing them at events, increasingly it is common to be drawn into conversations requesting a short introduction to agile. In this article I will share my thoughts and experiences around agile and HR departments, what they should know about becoming agile and how they can apply agile in their own work. Why does HR need to know what it means to become Agile? Agile generally first starts growing in the software development teams to enable short time to market delivery and enhancing the ability to respond to changes. 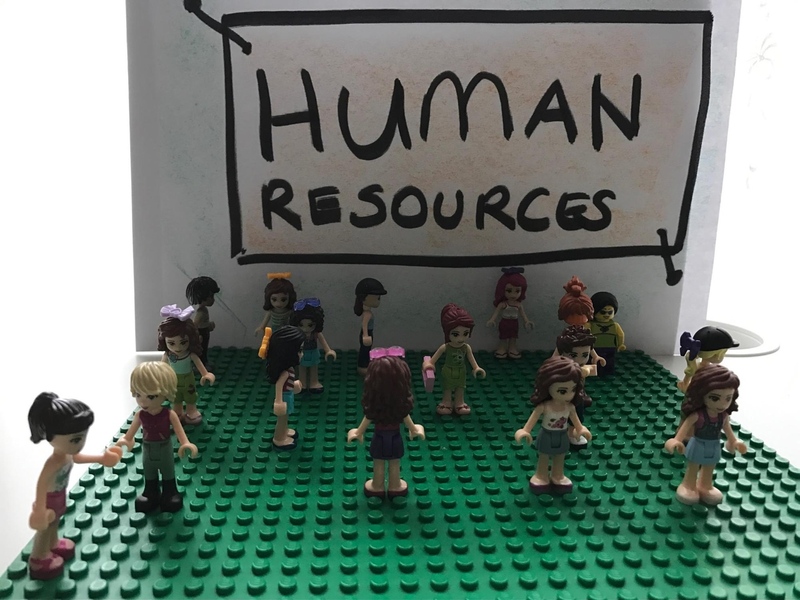 When people start working as agile teams some fundamental HR process changes need to be adapted in order for them to work better, collaborate, focus on value and commit to a common goal. If the HR policies and processes are not adapted to an agile context, these teams start facing impediments which they can’t solve themselves. This decreases the efficiency of the teams and prevents growth in the agile mindset. These are organizational impediments that HR departments should handle in order to support the teams. If companies desire their teams to be productive they must ensure their HR departments know what it means to become Agile. Becoming agile is not only adapting the practices, it’s also a mindset shift. For the cultural movement towards agility to begin, these teams need to be supported in a continuous learning environment by the HR policies. HR considers agility when recruiting new team members. Recruiting a super intelligent and skilled professional is not enough, you also need to look for people who are willing to work as a team member, people who are open to changes and can adapt to changing team dynamics. Recently, we have delivered multiple Agile & Scrum training workshops to a large company. Training was not only for the tech people, IT recruiters were also in the classes. When I spoke with one of the recruiters during the training he confessed that he now realized what it meant to be working agile and during the initial job interviews what he needs to observe and look for. HR should work with management to provide an environment that enables teams to make decisions. For Agile teams to be productive and nimbly responsive to change they need to be authorized to make decisions according to the feedback they receive from their clients. If they are not able to make decisions and are always stuck with long decision making processes, this limits their agility. By enabling them to make decisions, even if only in a constrained environment, agility accelerates. HR and management should provide an environment that enables growth of an agile mindset. The agile way of working is not something that only teams should care about. We generally notice that some time after teams start working in agile, some functional managers are afraid of losing control over their people or even their jobs. Before agile, they performed task assignment -- so what do they do now? These profile managers should be encouraged to evolve into agile leaders, taking care of improving the business. They should provide their teams safe to fail containers to foster creativity, growing as teams. So HR needs to encourage Agile values in the management teams. They should encourage people to be transparent, bold, able to learn from their failures and develop themselves into servant leaders. Training and talent growing are the responsibility of HR. Becoming agile is about a state of continuous learning and trying to change for the better. HR can’t enable this learning environment if they think they only need to provide some technical training to achieve this result. In one of my previous companies I was an internal Agile Coach, I was working closely with HR people to support continuous learning with tools, awareness workshops, cafe talks, and providing environments to enable people learn from each other. So to support this learning environment HR should know how to be agile. The ultimate goal is organizational agility. Companies just can’t hit this goal if they think that applying agile practices in the software development teams is enough. Companies are living organizations formed from different departments. To be able to gain organizational agility all of these units should work aligned, knowing what is the value they need to deliver. They all need to see what is happening and what needs to be done in what order and collaborate with each other. HR again needs to work with management to support this collaborative working environment and cultural mind shift. HR is generally responsible for developing and helping companies to apply the right performance management systems. If these systems encourage only individual performance or are stuck with the wrong KPI’s, you kill the heart of agile working. A system measuring success should be adapted and formed around encouraging teams to get better, being careful to avoid fake results created by cheating the system. How can HR teams apply Agile practices to their strategic and daily work? As I stated earlier I had an opportunity to work closely with HR teams when I was an internal Agile Coach. I had the opportunity to closely observe and be involved with their strategic initiatives and daily routines. HR teams transforming to become Agile is a critical and a must step. The HR division of the company I worked for was lucky to take this step early and started experimenting with Agile practices. HR departments have many products, services, complex projects with varying domain knowledge and therefore need a variety of skills to handle this complexity. People from different HR departments need to work together to further develop their products and services. I coached an HR team who had a goal to acquire talented young people to the company and to strengthen the brand image in the young population. This was a 9 month project recurring every year and before applying agile it was managed in the traditional way. There were people involved from various areas, including: recruitment, training, communication and branding departments. There was a fixed scope with milestones, activities performed with different departments and a hand over to each other after they performed their own tasks. Every department was responsible for their own outcomes and sometimes the workload was heavy for certain departments. This was solely the responsibility of the department facing the problem. We changed the way they provided and developed this service. First, all related people had Agile & Scrum training. A Product Owner was assigned and we formed a Development team from different HR departments. They put everything in a Product Backlog and ordered it . They started applying Scrum and committed that certain amounts of work be done and goals were reached every Sprint. Some of the benefits after they applied Scrum: a) they reached the business goals, b) they had a chance to learn from each other, c) they quickly found emerging solutions to problems with a collaborative mindset and synergy, d) there was not a single department becoming a bottleneck as they experienced previously, everyone helped each other for the smooth flow of work. HR departments also have multiple stakeholders of differing types. A lot of demands come from different parts of the organization. Every departments’ demand is their priority but HR departments also have limited capacity. I had this kind of experience with the Recruitment Department. I tried to help them to balance capacity and demand and to act to fill the most valuable positions. The first thing we tried to implement was a PULL policy. Then we visualized the workflow, from demand to the end of the recruitment. When we implemented these two practices they immediately realized some facts: a) to define an explicit PULL policy was very hard, because stakeholders also needed to be involved in this policy definition, but it was really vital; b) when the workflow was visualized it was easy to see the bottlenecks, who was stuck and who needed help, so visualization ended up decreasing the lead time; c) it was also helpful to use some metrics around success and open discussions to improve the process. People in HR need to know Agile and can actually benefit themselves from applying Agile practices. Although Agile originated in software development, it is clearly understood that it is beneficial and an enabler in every domain. Agile is not only practices but also a set of values and principles that fit every domain. HR departments are in the position of being enablers and so are a natural fit for companies becoming Agile . Please drop a line or leave a comment about your similar experiences, I’d love to hear them!